The lavish rooftop pool at the Montage Beverly Hills. Have your cocktails delivered while you retreat to a private cabana. 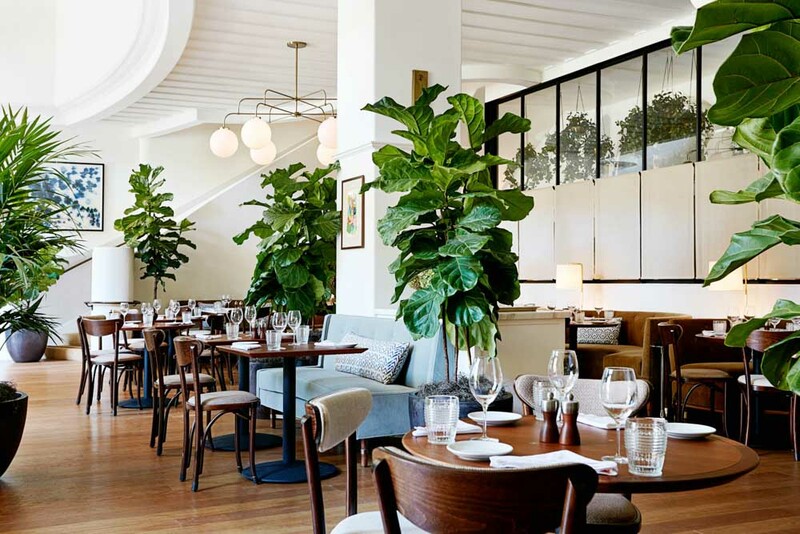 The cool, leafy interior of Beverly Hills restaurant, Georgie. 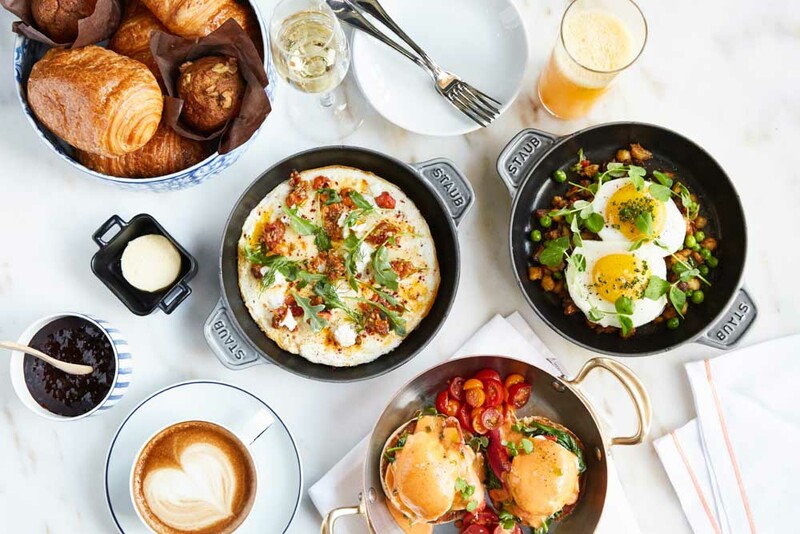 Geoffrey Zakarian's restaurant, Georgie, serves a breakfast worthy of any celebrity. Montage Beverly Hills. 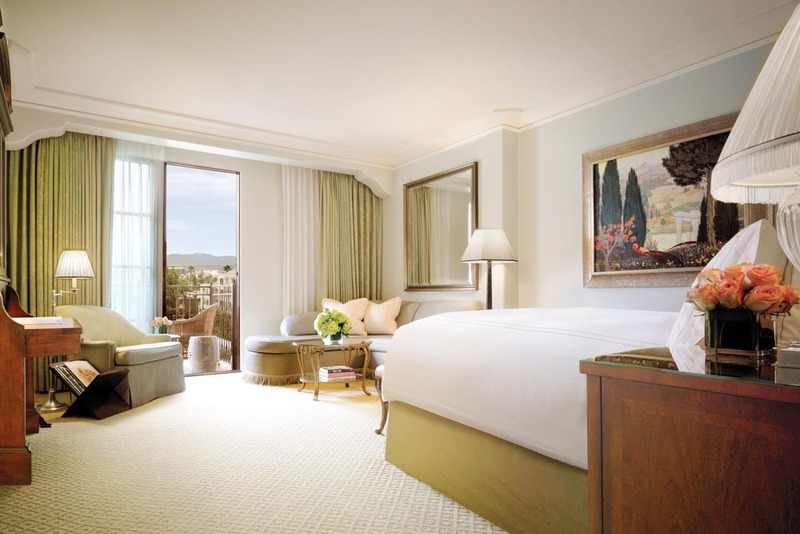 A room with a view; the Montage Beverly Hills hotel have guest rooms that overlook the Hollywood Hills. Maybachs cruise up and down Canon Drive, as a black Lamborghini revs its engine and stretch limos wait for celebrities. 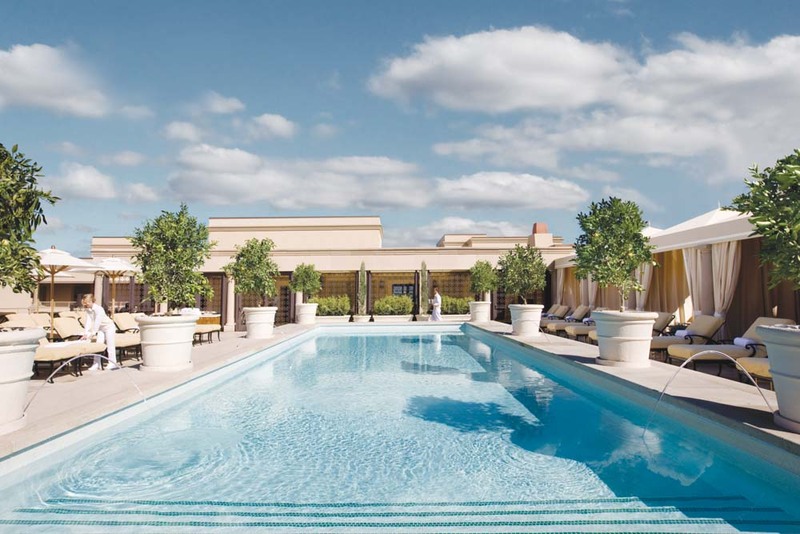 Welcome to the Montage – not just any hotel, this is the hotel in Beverly Hills. In case you were hiding under a rock in 1990, in the film Pretty Woman, a modern twist on My Fair Lady, Julia Roberts is romanced by Richard Gere at the Beverly Wilshire. But a lot has changed since Garry Marshall made his hit film, and not just the hairstyles. These days Edward and Vivian would stay instead at the Montage, pulling up in the circular driveway much like I’m doing right now. A red-vested doorman opens the door of my modest Uber ride; at the same time another greets the driver of the black Lamborghini that has pulled up next to me. The driver raises the James Bond-like scissor doors and steps out. Gold glasses, gold chains, white basketball shoes, he slinks past me like a cat. It’s Michael B Jordan and Ryan Coogler, the star and director of Creed. Just another normal day at the Montage. With its classic European design, Mediterranean-inspired luxury, a touch of vintage Hollywood glamour and sumptuous suites, this hotel is a celebrity favourite – a great place to hide from the paparazzi. US Condé Nast Traveler 2015 Readers’ Choice Awards voted it the top hotel in LA with a score of 93.9. The Montage is ideally located in the heart of Beverly Hills’ Golden Triangle, just north of Wilshire Boulevard and the famous Beverly Wilshire, and across from Rodeo Drive, the world’s most expensive shopping street with more signature stores per square metre than anywhere else in the world. Concierge Michael gives us a personal welcome and introduction that makes us feel as important as any famous guest, then our adorable butler Tony escorts us to our room. It’s a very special room: Suite 100 is equipped with a ‘Press for Champagne’ button that will instantly summon a bellboy with bubbly. Outlining all the features, Tony leaves us with instructions to call whenever we need anything. The room is gorgeous, classy and elegant with Grange French-style furniture. After leaping on to the bed and disappearing in a pile of fluffy pillows and gold-trimmed 500-thread-count Egyptian cotton sheets, we rush to the balcony and down a chocolate extravaganza welcome plate along with a bottle of bubbly while we watch people gathering below in the gardens for a concert. Then we grab our plush monogrammed bathrobes and head up to the rooftop pool and retreat to our private poolside cabana to savour views of the Hollywood Hills. The Montage recently underwent a $40 million renovation and a lot of it was spent on the restaurant and bar level. As evening descends we head down to dine at renowned chef and restaurateur Geoffrey Zakarian’s Georgie. Zakarian won the fourth season of Iron Chef: Super Chefs and this is his debut LA restaurant. Georgie serves modern American, the indoor–outdoor seating spilling out onto the walkway overlooking spectacular Beverly Cañon Gardens, a landscaped public garden area between the Montage and Thomas Keller’s Bouchon (of The French Laundry) across the way. Later, a mutual friend and celebrity publicist Amanda Archer, now part owner of the Canon Club across from the Montage, joins us for a drink at the newly renovated Garden Bar Lounge. “Seen Justin yet?” she asks over the sound of the pianist. Quelle horreur! We’re staying in the same hotel as Bieber and we’ve missed him? Another Peach Bellini, waiter! The next morning we look around eagerly at breakfast but no luck – apparently the Biebes only appears outside regular meal times. So we head up to the Turkish hammam-style spa we’ve heard so much about. Set across two levels, it’s 1858 square metres of spa luxury. We could get red-carpet-ready with a signature hammam Vichy ritual or a Kerstin Florian body illuminating treatment, but decide we’re happy to settle for a soak in the waters of the mosaic-tiled mineral pool. Refreshed, we head to the exclusive invite-only £10 Bar. Tucked discreetly away in a corner of the hotel’s second floor, £10 is a multi-award winning connoisseur’s lounge specialising in the world’s most precious whisky, The Macallan Single Malt. For the honour of an invite, expect to dish out up to $6000 for a single malt pour! That afternoon I have a real Pretty Woman moment. Lucas, the house driver, drops us in the Montage’s Rolls Royce to shop in nearby Rodeo Drive. This chauffeured limo drop-off and pick-up is a complimentary service to guests staying at the hotel. He then asks if he can drop us in town for dinner. “How about Maude (Aussie chef Curtis Stone’s hugely popular Beverly Hills restaurant)? Do you think you can get us a table?” Of course he can. My Pretty Woman dream has to end sometime… just not tonight! The perfect blend of vintage Hollywood luxury and restrained modern elegance that captures Beverly Hills’ glamour perfectly. Right in the heart of the ‘Golden Triangle’ and a stone’s throw from Rodeo Drive shopping. Classy Spanish Colonial Revival – ochre, arches and antiques. Impeccable – remember how Barney (Héctor Elizondo) anticipated Vivian’s every need? We loved the huge balconies, plush glamour French beds, Yves Delorme linen, marble bathrooms and the old-world movie star feel. From the Californian cuisine at the Rooftop Grill to modern American at Georgie’s, and great cocktails at the Garden Bar, the Montage makes it hard to venture out, though I recommend at least making it to Bouchon across the way for lunch. With rates starting at just under $1300 a night for a suite you’ll need a movie star budget; it’s probably not the best value in the Hills, though it is a notoriously expensive destination.